A six-DVD set of episodes from The Porter Wagoner Show and The Wilburn Brothers has been released featuring several Dolly appearances. The half of the set featuring the Wilburn Brothers includes a 1973 episode on which Porter & Dolly were their guests. The first volume of the Porter shows are all from before Dolly joined the cast and feature Norma Jean with Willie Nelson, Lefty Frizzell, Kitty Wells and Tex Ritter. The second and third volumes feature seven Dolly episodes with Gov. Jimmy Davis, George Morgan, Hank Snow, Faron Young, Conway Twitty, Webb Piece, and Don Gibson plus an episode of the program with Merle Haggard after she left. In addition, a bonus episode is Dolly's premiere on the show from Sept. 5, 1967, with guest Bobby Bare. The collection is available from Jim Owens Entertainment here for $119.80. Thanks, Jay! In advance of Tuesday's Berkley concert, The San Jose Mercury News on Wednesday ran a piece that originally appeared in The Boston Globe a few weeks back. Read it here. You'll probably be able to look for some new Dolly goodies in the near future, thanks to an agreement announced Tuesday for her merchandise manufacturing and distribution deal. Bravado, which works with artists such as Gwen Stefanie, Elton John and Metallica with their merchandise, will handle her offerings. In addition to more traditional items, the collection will also include a special pink Backwoods Barbie cowboy hat. (Pink Dolly Stetsons have become a trademark accessory on her European tours for the past two years.) Read the press release here. Speaking of hats, Miley Cyrus tells E! Online that the head coverings were godmother Dolly's gift of choice for those on the set of her Disney Channel series Hannah Montana during her appearances on the program. She autographed and gave hats to everyone on staff, from janitors to producers, Cyrus said. "It was like 500 hats!" Read more here. With the resumption of Dolly's Backwoods Barbie World Tour coming up in San Diego on Friday, a section of seats became available this week for the previously sold out concert. Get them from Ticketmaster. Meanwhile, Tuesday's show at the University of California Berkley gets props from The San Francisco Bay Guardian with a piece here. A gaggle of Dollys will take center stage as part of the annual Gay Pride Parade in Brighton, England, it has been announced. Sussex radio station Southern FM is sponsoring a Dolly theme event to honor the parade's "Pride Around The World" theme. A total of 16 men and six women will don full Dolly regalia as they dance to tunes, including a new special remix of "9 To 5" by the station's producers. Read more here. Thanks, Dion! The full British albums charts came out on Monday, and Very Best Of Dolly Parton Vol. 1 drops 25 places this week to No. 59 on the U.K. pop albums tally, also slipping one to No. 2 country in its sixth chart week this year. However, thanks to Alysha for telling me it remains the No. 1 country album download from iTunes U.K. this week. Jessica Simpson's entry into country music made CMT.com columnist Hazel Smith's news this week here, where she notes Simpson's friendships with Dolly and Willie Nelson. "Willie and Dolly are as smart as they come in any music genre," she notes. "So if they like Jessica, I'm prone to think she ain't all bad." Dolly wrote and sings on the title track to Simpson's country CD, Do You Know, which hits stores Sept. 9. Although park materials have promoted The Polar Express 4-D Experience as part of the Smoky Mountain Christmas Festival Nov. 8-Jan. 3 at Dollywood since this year's opening, the first details of what the "experience" entails were revealed Monday with the issuance of a press release on the attraction. Based on the hit Warner Brothers/Shangri-La Entertainment film, which was based on the Chris Van Allsburgh book, the Pigeon Forge version will use the park's Imagination Cinema, home of Thunder Road, to take the audience along for the ride. "This Christmas, I'm inviting families to take a spectacular holiday journey where dreams become real, and everybody knows I dream bigger than just about anybody else," Dolly said in the release.� "On The Polar Express 4-D Experience, all you have to do is believe, and I sure do!" The ride's distributor calls it "by far the finest magical cinematic experience of our lifetime." A 3-D digital projection system shows the film, while sensory effects such as falling snow on the audience and the smell of cocoa when hot chocolate is served to the film's characters add to the experience. SD Web Pros, the guys behind Dolly's upcoming official website, Dolly Parton.com, over the weekend release a very nice promo video for Dolly's current CD, Backwoods Barbie. The video, available here, concludes with the logo for Universal Music, which is distributing the album in Europe, so it may be the commercial which is airing in Denmark at present, and I've heard others say it may be a video that was played at the start of some of her concerts in Europe on the current tour. In related news, The Times in London over the weekend branded Dolly the icon of the new feminist movement, analyzing her empowering effect on women at her concert there a few weeks back in a piece here. Don't forget if you're a member of the Dolly-ite online fan community for Dolly's music website, Dolly Parton Music.net, and you're planning to attend one the stops on the August segment of her Backwoods Barbie World Tour, get your entries in starting Monday for the contests to win meet-and-greet passes. Entries will be accepted for Friday's San Diego concert and next Sunday's Los Angeles engagement at 9 a.m. Central time Monday, with entries taken for later concerts in coming days. The full British albums charts weren't available yet as of press time Sunday night, but the top 40 had been released, and Very Best Of Dolly Parton Vol. 1 was not among them, meaning it has fallen below No. 40 on the pop albums tally, down from No. 34 the previous week, its fifth since re-entering the top 100 this year. Thanks to Jonathan for pointing out that LGBT cable network LOGO is promoting its new series Sordid Lives, which is set in Texas, with a celebration of all things Southern, including good old country music. Viewers are being asked to vote online for the best country videos, and among the options is Dolly's performance of "9 To 5" on the premiere of Barbara Mandrell and the Mandrell Sisters, which as of press time was in second place. Vote here! Amazon.com has begun accepting pre-orders for Jessica Simpson's upcoming debut country album, Do You Know, for which Dolly wrote and provided harmony vocals on the title track. The set will be released Sept. 9. Reserve your copy here! Fans will soon get to ring in each month of 2009 with a new image of Dolly, thanks to Blossom Rock Publishing, which in association with London's Daily Mirror is releasing a new unofficial Dolly calendar in the U.K. in August. You may sign up here to be alerted when it is available in the U.S. Thanks, Niko! Dolly's Backwoods Barbie seems to be catching fire in Denmark, where it leaps nine places to No. 11 in its second week on the Danish pop albums chart. Thanks, Claus! Here in the U.S., its single "Jesus & Gravity" falls one to No. 2 in its 13th week on the Pure 12 Pack Countdown on CMT's digital cable channel, Pure Country. In other news, Dolly Parton Music.net on Friday started a contest with Country Hound to give away an autographed copy of the CD album, a radio-only CD single of the song and a t-shirt. Enter on their site; the winner will be selected Aug. 1. It's been several years since singer Eva Cassidy lost her battle with cancer, but the late entertainer has a CD of "new" songs coming out next month which includes a Dolly cover. The collection actually consists of previously unreleased tracks, among which is "Coat Of Many Colors." Somewhere will hit stores Aug. 26 from Blix Street Records. Get your copy here! Playbill has announced that its Dolly interview about 9 To 5: The Musical will be broadcast as part of its Playbill Presents show on the online Playbill Radio at 7 p.m. Eastern Wednesday, with repeats at 2 a.m. and 11 p.m. Thursday, 2 p.m. next Friday, 4 p.m. Aug. 2 and 11 a.m. Aug. 3. An abbreviated version may also soon be available as a podcast. Sevierville's Mountain Press this week covered the move of Dolly's annual parade in Pigeon Forge to May with an article here. After several weeks of declining chart position, Dolly sees her Backwoods Barbie gain some ground this week in the Aug. 2 Billboard numbers. The CD rises six spots to No. 58 country albums in its 22nd chart week. Elsewhere on the country list, her 16 Biggest Hits inches down four to No. 39 in its 41st week, while Playlist: The Very Best Of Dolly Parton tumbles 11 to No. 68 in its third week. Another of Dolly's European concerts makes the magazine's BoxScore concert list: her June 21 date at Live at the Marquee in Cork, Ireland, which sold out all 5,000 seats and grossed $584,786. The Emmylou Harris collection All I Intended To Be, with Dolly on the track "Gold," drops five to No. 25 country in its sixth week, also falling 24 to No. 120 pop. In Canada, the album is down six to No. 19 country. Brad Paisley's Time Well Wasted, featuring Dolly on "When I Get Where I'm Going," holds steady at No. 7 on the country catalog albums list and rises three to No. 44 Canadian country. The various artist collection God Bless the USA, with Dolly's "Color Me America," gains one to No. 74 country in its 12th week. Taylor Swift finds her Wal-Mart exclusive EP/DVD Beautiful Eyes debuting at No. 1 country and No. 9 pop with 45,000 copies sold, while her debut CD, Taylor Swift, loses one to No. 2 country and gains two to No. 12 pop with 35,000 copies sold in its 91st week. For those who've been bugging me for an answer, here you go! A Dollywood spokesperson confirms Dolly is planning to make at least one public appearance on the park grounds while she's there for her Aug. 16-17 concerts. No word on what she'll be doing, but often exact details of what day, time, location, etc. aren't released publicly in advance. I'm told she's also going to try to make a visit during the Festival of Nations next year prior to her official May "Homecoming." Thanks! The CMT blogs have their two cents available this week on the fan documentary For The Love Of Dolly. See here what they had to say. Dolly gets a nice mention in Christopher Ciccone's book My Life With My Sister Madonna about his famous sibling, I'm told. In Chapter 10, he discusses directing Dolly in her unreleased video for the techno remix of "Peace Train" back in 1997 in great detail, capturing her look, attitude and professionalism. He also reveals that he suggested she and his sister record an album together of each one covering the others' hits. Dolly appeared receptive, but when he mentioned it to Madonna, she didn't seem interested, he said. He also revealed that Dolly called him personally after the shoot to thank him and tell him how much fun it was, which he said was the only time an artist ever called to thank him personally after they worked on a project together, something that really impressed him. Get the book here. Thanks, Craig! The American Eagle Foundation sanctuary at Dollywood will release two more bald eaglets into the wild on Thursday, they announced this week, and they happen to have been named by Dolly's goddaughter, Miley Cyrus, and her dad, Billy Ray Cyrus. Miley named hers Hope (her given middle name before she changed it to "Ray" earlier this year) and dad named his Tennessee. Read more here. Leesburg, Fla., might soon be getting on Dolly's Imagination Library literacy bandwagon, The Daily Commercial reports here. The local Rotary Club is looking at starting a chapter there. Stumbled upon a new section of Gospel Music Update today where they're now posting videos. And the first one up is Dolly doing "If We Never Meet Again" from her days on The Porter Wagoner Show. Catch it here! Dolly's goddaughter Miley Cyrus was singing her praises on Good Morning America Tuesday, explaining how she wants to model her career after "Aunt Dolly." Access streaming video of the interview and read an abbreviated story based on it here. Dollywood has announced its headliners for 2009's Festival of Nations. Le Grand Cirque will perform its show "Imagin�." Check out more here. Thanks, Jason! The Festival will run from the park's March 28 opening through April 27. Tropical Storm Dolly reached minimal hurricane strength on Tuesday afternoon in the Gulf of Mexico and became Hurricane Dolly. The system was expected to make landfall along the Texas/Mexico border around 1 p.m. Wednesday. Heavy rains and flooding were the primary concerns for the region. Grand Old Opry legend Jack Greene is working on a new duets CD, Precious Memories, Treasured Friends, which should be out in spring or summer 2009 and include a duet with Dolly, according to The Bellingham Herald here. Others who will appear on the project include Garth Brooks, Loretta Lynn and Brad Paisley. The charity auctions associated with Dolly's October benefit show in Kentucky are winding down. The one here for a pair of front row seats at the concert (the seats happen to be pink rocking chairs the winners get to take home which have been autographed by Dolly herself) stands at $1,725, while the one here for two orchestra seats and airfare to the 9 To 5: The Musical premiere in Los Angeles is at $2,000. Both auctions end Thursday. LA radio station GO Country 105 FM is giving away two tickets for Dolly's Aug. 3 concert in the city. Visit their website here for details. Thanks, Mike! Confirming what she reportedly said from the stage once or twice in Europe last month, "Shinola" will be the third single from her album Backwoods Barbie. The track will ship to radio this week, according to the release. On Tuesday, it's into the recording studio to lay down her vocals for the collaboration "Do You Know," which she wrote as the title track for Jessica Simpson's upcoming debut country CD. In the release, Dolly noted: "Well, Jessica Simpson has recorded a song I wrote for her titled 'Do You Know. '� I believe that will be the name of her new CD as well.� Not only did she record it, she sang the living daylights out of it.� Boy, can she sing.� I'm excited and honored that she recorded my song, but equally as excited that I am going to sing on it with her as well.� Guess you could say it's the 'blonde leading the blonde.'" As was expected, a third U.S. leg (with some Canadian dates as well) will be forthcoming in the Backwoods Barbie World Tour this fall, it was noted. The additional concerts, only one of which (Atlanta) has been announced at this time, will begin in October. The 17 dates on her just-completed European tour played for more than 170,000 fans, exceeding by 30,000 the number she played in last year's 21-concert trek across the continent, which until now was her record audience for a European tour. Patty Loveless, who honed her skills as a teen-ager hanging out with Porter Wagoner and Dolly, pays tribute to the legendary duo by taking on their classic composition "The Pain Of Loving You" on her upcoming covers album, Sleepless Nights: The Traditional Country Soul Of Patty Loveless, which will hit stores Sept. 9. She offered a breathtaking performance of the tune last year at a Grand Ole Opry tribute to Porter, introducing the song in the night's second set as "one of the most heartfelt lyrics" every written. Other tracks on the CD include "Don't Let Me Cross Over," "I Forgot More Than You'll Ever Know," "Please Help Me I'm Falling" and "Cold Cold Heart," among others. Reserve your copy here! Image at left of Loveless with the song's writers and original performers, Porter & Dolly, is copyright � 2007 T. Duane Gordon/www.dollymania.net and may not be reproduced without prior written permission. Confirmed: 'Barbie' Gone In U.K. The full British albums charts came out on Monday, and as was expected, Dolly's Backwoods Barbie fell out of the top 100, down from No. 74 the previous week, its fifth overseas. In other news, The New Statesman in Britain gave high marks to her London concerts a few weeks back with a piece this weekend available here which notes: "There's no feminist icon quite like Dolly Parton . . . she comes across like Madonna's daft, trashy auntie." Access Hollywood has posted footage on its website of Dolly at the 9 To 5: The Musical press conference in New York last week. View it here. The third and final of Dolly's concerts next month at Dollywood sold out over the weekend, the theme park has revealed. Her 2 p.m. show on Aug. 17 now joins the 2 p.m. and 7 p.m. performances on Aug. 16 as having no more tickets available. However, it is common that a week or so before the concerts, sponsors turn in unused seats, allowing a handful more to become available at that time, so check back around then if you want to go and don't have tickets yet. Kristen Chenoweth is still stoked to try and get a chance to sometime in the future play Dolly in a stage musical based on her life. Dolly has been quoted as citing both Chenoweth and Oscar winner Reese Witherspoon as possibilities to portray her if she ever finishes a Broadway musical based on her life, but Chenoweth told frequent Dolly interviewer Terry Morrow of The Knoxville News-Sentinel last week that she is still trying to be patient in waiting for Dolly to finish the show so she can try out for it. Read the piece here. Tropical Storm Dolly, the fourth named storm of the Atlantic hurricane season, formed in the Caribbean Sea on Sunday. The system should cross the Yucat�n Peninsula Monday before entering the Gulf of Mexico and could make landfall again in northern Mexico or southern Texas around Thursday morning. Read more from CNN here. Dolly managed this week to keep her three CDs in the top 75 country albums chart when Billboard released the July 26 numbers on Thursday. Her 16 Biggest Hits moves up two to No. 35 in its 40th week, Playlist: The Very Best Of Dolly Parton gains four in its second week to No. 57, and Backwoods Barbie dips three to No. 64 in its 21st chart week. Emmylou Harris sees her All I Intended To Be, featuring Dolly on "Gold," lose three to No. 19 country in its fifth week, also dropping four to No. 96 pop. In Canada, the album falls three to No. 13 country and is down 30 to No. 137 pop. Brad Paisley's Time Well Wasted, with Dolly on "When I Get Where I'm Going," gains two to No. 7 on the country catalog albums list and re-enters the Canadian country top 50 at No. 47. The various artist collection God Bless the USA, with Dolly's "Color Me America," tumbles 33 to No. 75 country in its 11th week. The self-titled debut CD from Taylor Swift remains steady at No. 1 country and rises three to No. 14 pop in its 90th week, while Toby Keith's 35 Biggest Hits also remains steady at No. 2 country and gains four to No. 24 pop in its 10th chart week. The press conference announcing the theatre and dates for Dolly's 9 To 5: The Musical to open on Broadway continued to earn press on Wednesday and Thursday. Video of the cast performing the title song (with some new lyrics) plus interviews with them and Dolly is available from the Associated Press here. Playbill offered a more in-depth piece here in which scriptwriter Patricia Resnick offered: "Dolly is the template for what famous people should be like, and rarely are. She is the most generous, warm, funny, smart person in the world. So to get to work with her again was wonderful." (Interview audio is expected will be broadcast at a yet-to-be-announced date on PlaybillRadio.com.) Thanks to Matt for pointing out some great shots available for viewing from Getty Images here, and thanks to Jeff and Bridget for directing me to Broadway World's photos from the announcement here. The back section (rows AA-EE) for the 2 p.m. Aug. 17 concert of Dolly's at Dollywood has sold out, the park has announced, leaving just seats in the middle section (rows M-S) available for $60 each here. Her shows at the park at 2 p.m. and 7 p.m. Aug. 16 are sold out. The new Target commercial featuring Dolly's former single "More Where That Came From" has catapulted the 15-year-old track into the top 100 country downloads this week on iTunes. Thanks, Chad! Dolly's official music website, DollyPartonMusic.net, on Monday revealed the schedule for entering its Dolly-ite meet-and-greet contest for the initial dates on the next U.S. leg of her Backwoods Barbie World Tour. Entries may be submitted starting July 28 for her Aug. 1 San Diego engagement, with 24-hour entry periods continuing over the next several days for subsequent concerts, ending on Aug. 1 with her Aug. 14 St. Louis performance. No word has come yet as to whether any meet-and-greets will be offered to Dolly-ites for her Dollywood shows later in August (although I personally doubt they will be available since they are fund-raising shows and the website has no connection to either the park or her charity organization) or when entries will be taken for the backstage passes at her Oct. 24 Atlanta show. The two charity auctions from St. Mark Catholic Church have been re-started on eBay. Organizers say an error in the descriptions required they be re-listed, so anyone who had bid on them originally must bid again if they wish to continue participating in the auctions. One here is for two front row seats to her Oct. 25 benefit concert for the church and two other charities plus autographed pink rocking chairs which will serve as the winners' seats for the show and which they will take home afterward (bids had gotten to $1,000 before the re-listing), while the other here is for opening night tickets and airfare to the LA premiere of Dolly's 9 To 5: The Musical (bids for it had reached $700). Both auctions end July 24. Dolly has ranked fifth in a nationwide British survey of single lesbians as the hottest female celebrity over 50, it has been announced. Coming ahead of Dolly were Helen Mirren, Susan Sarandon, Meryl Streep and Goldie Hawn. Joan Collins came in sixth. On the male side, single gay men chose Piers Brosnan as No. 1, followed by Bruce Willis, Richard Gere, Harrison Ford, Mel Gibson and Sean Connery. The poll was taken by LGBT dating site gay-PARSHIP. The initial U.S. leg of Dolly's Backwoods Barbie World Tour ranks at No. 99 for the top 100 tours on the continent for the first half of 2008, Pollstar revealed Monday. The 13 concerts grossed $3.0 million, which also made it the last of the 15 country tours on the list. The shows played for approximately close to 43,000 fans. Publicly-released grosses for eight of the shows had totaled about $2 million, so the final five cities for which the attendance and gross ticket sales had not been released must have totaled an additional $1 million. For comparison, the three concerts for which grosses have been released on the tour's European leg (one night in Kilkenny, Ireland, and two shows in Belfast, Northern Ireland) brought in more than the entire first American segment, raking in nearly $3.8 million from 31,000 concert-goers. After 17 engagements across the Atlantic, Dolly is back in the States and will get back to the second North American leg of the tour kicking off in San Diego Aug. 1. Another show in Dolly's series of three concerts to benefit the Imagination Library at Dollywood next month has sold out. The park revealed on Monday that tickets were gone for her 2 p.m. Aug. 16 engagement, joining the 7 p.m. show that evening as sold out. Tickets in the middle and back sections remain available here for the 2 p.m. Aug. 17 concert. Gossip guru Perez Hilton on Friday posted streaming audio of the UK remix of Dolly's "9 To 5" by the mixers Love to Infinity, DollyPartonMusic.net reported on Monday. Check out the song here! When Dolly is in Richmond, Ky., in October to perform at a fund-raising concert, she may be singing to some kids receiving her books. Her international Imagination Library literacy program is expanding into Madison County there, with a kick-off planned Wednesday in the city, The Richmond Register reported here Monday. The San Francisco Bay Guardian offers up yet another praiseful review of Emmylou Harris' All I Intended To Be this week, and as many critics have noted since the CD came out, its collaboration with Dolly and Vince Gill on "Gold" is the album's highlight. "Harris and Dolly Parton harmonize to knee-buckling effect on the apologetic chorus . . . Parton's signature trills are used in marvelously sob-worthy measures here, but the real punch in the gut comes when Vince Gill steps in to fill out the song's three-way harmonies," it notes. Read the full review here. Dolly still has one album just outside of the top 20 pop list, and atop the country side, overseas, but it looks like her current studio album could be ending its brief ride there. 2007's The Very Best Of Dolly Parton Vol. 1 remains steady this week at No. 1 country and No. 21 pop in its fourth week on the U.K. charts this year, but Backwoods Barbie moves perilously close to falling off the chart, dropping 11 to No. 74 on the 75-position pop albums tally, although it remains the third-highest-ranked country CD on the list in its fifth week. Stateside, her video for "Jesus & Gravity" regains the top spot on CMT's digital cable channel, Pure Country, rising one to No. 1 in its 11th week on the Pure 12 Pack Countdown. Vote for it in the regular CMT countdown here and 12 Pack here. Thanks to several readers in recent days who drew my attention to the new book How Dolly Parton Saved My Life: A Novel Of The Jelly Jar Sisterhood, which comes out on Tuesday. The Charlotte Conners tome tells the tale of four women who come together to start a catering business in Atlanta. The founder's first hire is a pastry chef who lives by the rules Dolly lays out in song, hence the title. Publisher's Weekly calls it "Steel Magnolias meets the Food Network." Entertainment Weekly gives it a "B+" here. Reserve your copy here! A critic at The Times in London uses Dolly this week as an example of stellar art which it has taken the sophisticates decades to accept and admire, making the point in a praiseful piece on the new Abba-centric film Mamma Mia! . She recalls a recent article in the paper in support of Dolly and said it was correct in its assertions, adding that she would go further and compare Dolly's vocal performances to those of the world's great opera singers. Read the item here. In related news, The Sunday Mirror likewise gives a very positive review of her recent London shows, saying "you'd have to be a real misery not to admire her charisma and her voice." Read it here. A Dolly outfit will be on display as part of the Aug. 9 Tennessee Performing Arts Center fundraiser "Iconic Blondes: Legally, Naturally and Otherwise (It's an attitude, not a hair color)," The Tennessean reported Sunday. Get the details here. Another section for Dolly's fall Dollywood fund-raiser shows has sold out. This time it's the 2 p.m. Aug. 16 show's back section, rows AA-EE ($35 each). That leaves just the middle section (rows M-S, $60 each) available for Saturday, since the day's 7 p.m. show is completely sold out. The middle and back sections remain available for the 2 p.m. Aug. 17 show. Get yours here! A Dolly quote of several jokes from the stage banter on her current tour led off gossip maven Liz Smith's column Sunday. Take a read here. Thanks to Jonathan for alerting me that Gay Wired is giving away five copies of the fan documentary DVD For The Love Of Dolly. Enter here! Jake's Dolly Talk Coming To U.S.
Scissor Sisters singer Jake Shears will see his interview with Dolly which ran on British television a few months back get a spot on U.S. television this fall, The Knoxville News Sentinel's Terry Morrow revealed Friday. He reported here that LGBT cable network Logo will use the interview in the new season of its "Real Momentum" documentary series. Although the series returns to the air on Aug. 2, the air date for Jake's Adventure in Dollywood has yet to be announced. It's not Dolly's first appearance in the series, though. 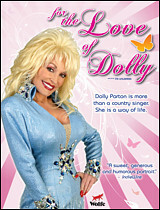 In March 2007, the network aired the television premiere of the fan documentary For The Love Of Dolly as part of the same series. Across the sea, The Very Best Of Dolly Parton Vol. 1 holds on for another week in the Irish pop albums top 100, falling to No. 87 in its 57th chart week there. St. Mark Catholic Church, the Kentucky church hosting the Oct. 25 Dolly benefit concert, has announced that 20 extra VIP tickets have become available and are being offered on a first-come, first-served basis. The tickets, $175 each, allow the bearer to receive floor seating for the concert, valet parking and admission to a reception with food and drink (sorry, no meet-and-greet, as those tickets were available only earlier in the year). E-mail here for information and to place orders. The initial members of the committee which will choose Dolly's books for the British version of her international literacy program have been announced, according to Booktrade. The founding members of the UK Imagination Library Selection Committee are available in the article here. Three Dolly titles are on the Billboard charts this week, the July 19 figures from the magazine revealed Thursday: one going up, one going down and one showing up for the first time. Wal-Mart had dramatically reduced the price for SonyBMG Playlist greatest hits collections last week, spurring tremendous sales of the titles in stores nationwide. This allowed several of the CDs to pop up on the charts after a few weeks off or having not previously been on there at all. Among those new listings is Dolly's installment in the series. Playlist: The Very Best Of Dolly Parton is the week's highest-charting newcomer on the country albums list, earning it the distinction of the "Hot Shot Debut" at No. 61. Also gaining in its 39th week is her 16 Biggest Hits, up six to No. 37. Down, though, is her current studio album, Backwoods Barbie, which falls three more to No. 61 in its 20th chart week. Pal Emmylou Harris, on whose CD, All I Intended To Be, Dolly joins in for "Gold," drops six to No. 16 country in its fourth week, also losing 30 to No. 92 pop. In Canada, the album loses four to No. 10 country and is down 29 to No. 107 pop. Brad Paisley's Time Well Wasted, featuring Dolly on "When I Get Where I'm Going," rises five to No. 9 on the country catalog albums list, while the various artist compilation God Bless the USA, with Dolly's "Color Me America," moves up 17 to No. 42 country in its 10th week. The self-titled debut CD from Taylor Swift remains steady at No. 1 country but loses three to No. 17 pop in its 89th week, while Toby Keith's 35 Biggest Hits also remains steady at No. 2 country and slips two to No. 28 pop in its ninth chart week. You should have known it wouldn't take long. Just three days after the advertisement first ran on national television, the new Target ad featuring Dolly singing "More Where That Came From" popped up on YouTube Wednesday. Watch it here! Press continued this week of last weekend's concerts in London to close out Dolly's European leg of the Backwoods Barbie World Tour. The Guardian offered a brief analysis of Dolly not only as a role model for feminists but for people everywhere with a column here, and The Times provided an outlet for the complaint from one of Dolly's lesbian fans at the show that she pays a great deal of attention to her male gay fans in her stage banter but not the female ones. Read that note here. Dollywood on Wednesday again updated the ticket status on Dolly's Aug. 16 and 17 concerts at the park to raise funds for her international Imagination Library literacy program. The 7 p.m. Saturday show is now sold out, although some tickets remain on sale here for the middle and back sections of both days' 2 p.m. performances, the front sections for which are sold out. As promised, the pre-sales and charity auctions began Wednesday for Dolly's Oct. 25 engagement in Richmond, Ky., to benefit a local church, breast cancer awareness and a home for mentally challenged women. The auctions, via eBay, offer two tickets in the center of the front row with pink rocking chairs autographed by Dolly that the winner gets to take home here and two tickets and airfare to the LA premiere of 9 To 5:The Musical in September here. The auctions end on July 19, and as of press time Wednesday night, the rocking chairs had a bid of $510 (that prize includes all of the VIP privilages of tickets sold ealier in the year such as the pre-show party and valet parking) and the musical had a top bid of $255. Regular tickets for the concert are available from the church's website here and via Ticketmaster using the password DOLLY. The long-awaited DVD of the Dolly fan documentary For The Love Of Dolly came out on Tuesday, and several fans will want to snap it up to catch a glimpse of themselves. Although probably a few hundred fans were interviewed at least briefly and several dozen for extended periods of time, the final documentary focused on five of the most dedicated and often over-the-top followers, including multiple appearances by Dolly herself. The DVD gives a little insight into some of the others who participated in the project with a 30-minute featurette including brief snippets from several dozen interviews, a handful of more extended fan profiles (of a drag queen inspired by Dolly, a British Dolly impersonator, a British woman with a Dolly room in her house, an African American singer whose hero is Dolly and a few others), a behind-the-scenes montage featuring the film crew and some of the friends they made during shooting, some extended footage from scenes which are in the documentary and more. (Even your webmaster pops up in the featurette with a brief quote, a couple of photos in the behind-the-scenes montage and footage of Dolly feeding me a finger of banana pudding. ) Get your copy of the DVD here! Another Dolly boxed set must be on the way, Billboard revealed in a story out Tuesday. Although no other information has been released on it to my knowledge, the piece, available here from Yahoo, states that a Dolly anthology is among "a handful of enticing boxed sets" due in the fourth quarter of 2008. Others which piqued the writer's interest are coming from Jesus and Mary Chain, Jane's Addiction, Rob Zombie, Nina Simone, Roy Orbison and Hall & Oates. The overall article, though, discusses the waning sales of traditional boxed sets in recent years. Performing Songwriter magazine, which has paid homage to Dolly in the past, has named her in the current issue honoring the publication's 15th anniversary one of its dozen "Independent Icons" who paved the way for today's independent label aritsts. Others recognized as icons include Johnny Cash, Willie Nelson and Kris Kristofferson. The magazine also features a list of the top independent label artists, dubbed its "Indie 100," which includes pals such as Emmylou Harris and Alison Krauss. Where was Donna Noble when she and The Doctor signed off over the weekend? Watching Dolly instead of herself! Catherine Tate, the actress who plays the current side-kick on the BBC's reincarnation of the Doctor Who franchise, passed up Saturday night's fourth season finale broadcast, her last appearance on the program, to take in one of Dolly's two sold out concerts in London which wrapped up the European leg of her Backwoods Barbie World Tour, Tate told the BBC here. 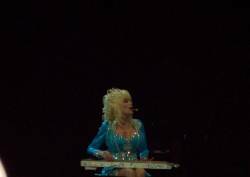 (By the way, check out Rare Dolly's review and photos from the concerts here. Thanks, Andrew!) The season is currently airing in the U.S. on SciFi (and is your webmaster's personal favorite program on television at the moment, with its spin-off Torchwood running a close second). Reports have indicated that the episode will be the show's last for a while � the BBC plans some Doctor Who specials in 2009 but won't resume regular episodes until sometime in 2010. The note wasn't Dolly's first brush with the show, though. You may recall that when SciFi bought the U.S. rights to the first season, the BBC announced its impending American arrival by posting a webpage online featuring the Doctor's Tardis landing on the White House lawn as Dolly's version of "The Star Spangled Banner" played in the background. Chris Thile, formerly of Nickel Creek, says working with Dolly was amazing. He was asked about his association with her (he played and sang on a couple of her projects, and she popped in at one of his nightclub concerts in Nashville a few years back to sing a couple of songs with him on stage) in a Q&A on ESPN.com of all places. Turns out that Thile's current band, Punch Brothers, is a finalist for a song contest the network is running for the centennial of "Take Me Out To The Ballgame." A viewer asked him during the online chat what it was like to work with Dolly, and he responded: "It was unbelievable. Dolly is Dolly, all the time. That is not an act. That is who she is. She offered me kissing lessons once and I should have taken her up on it...it was in jest though. Do not want any tabloid fodder. The other cool thing about her is that she has remained really sweet, and she really takes care of the people who work for her. She is awesome!" Read the full interview here. 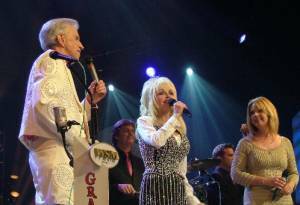 Could there be Dolly-ite meet-and-greets at Dolly's Aug. 16 and 17 concerts at Dollywood. A real yes or no has yet to be announced, but her music website DollyPartonMusic.net on Tuesday hinted at the possibility by adding the shows to its tour itinerary (more than three weeks after tickets first went on sale) and including a "TBA" in the column where it identifies the time for entering the site's contests for members of its online Dolly-ite community to win backstage passes. Tickets for the three concerts remain available here. Being outside of the U.K., I can't access the British version of iTunes to confirm, but reader Allan tells me that the site has just posted for sale a new Dolly remix of "9 To 5." The single, dubbed "The Love To Infinity Mixes," features a radio edit and club mix, he says. Thanks! Don't forget that the pre-sale for Dolly's Oct. 25 charity benefit concert in Richmond, Ky., begins at 10 a.m. Wednesday via St. Mark Catholic Church's website here and Ticketmaster. The pre-sale password is DOLLY, and it is recommended that for better seats you go through the church's site. The church should also have a couple of cool related auctions on its website starting around that time as well. Special thanks to Wayne for sending in some photos he took from Dolly's first of two nights in London over the weekend to wrap up the European leg of her Backwoods Barbie World Tour. They are available in a gallery for your viewing pleasure here. Also, The Evening Standard gave the shows four out of five stars, saying the fans knew her concerts are "part gig, part stand-up comedy set," so they enjoy the long stories she tells between songs. Even singing old songs and telling the same jokes she has for years, she made them all sound new and "fresh as the country air," the critic concluded. Read the full review here. Dolly triumphantly wrapped up the European leg of her Backwoods Barbie World Tour on Sunday night with the second of two nights in London, England, playing to an arena full of adoring fans. Attendees say both London concerts were recorded for the upcoming concert DVD for which her two Glasgow shows were also filmed (in London, I'm told she wore the same outfit on each night). Combined, she played for nearly 46,000 fans Saturday and Sunday. The crowd almost never sat down as she sang. Sunday, those who arrived early got to see a sound check, and she extended her performance of "Brother Love's Traveling Salvation Show" before leaving the stage for her intermission. When someone shouted out just before "Little Sparrow" that they wanted to hear "I Will Always Love You," she told them to hush and that she'd sing it later (when she did perform it, she dedicated it to the fan who had requested it earlier). On Saturday, the entire crowd seemed to be singing along to that tune, which I'm told left her "absolutely glowing." Special thanks to Charlotte for sending in some shots from Saturday night's show (including the one at left), available in a gallery here, and thanks for concert recaps from Helena, Gerard, James and Catherine. Also, check out an AFP photo from Saturday's show here. In related news, thanks to Greg for pointing out some shots from the tour available online from Contact Music here, and thanks to Jonathan and Catherine for telling me that Friday night in Cardiff went just as well. The smaller venue, about 5,000 people, made it a much more intimate setting, but the audience was so receptive that Dolly gushed she wished she could stay all night. The city's Western Mail recounted the show here, dubbing it "a master class in what makes Dolly the first lady of country and western the world over." The paper also had a very perceptive interview with her here which was conducted about six months back. Dolly was all over the charts this weekend. In Britain, where she was wrapping up her tour there, she retained the top country album in the land. Last year's The Very Best Of Dolly Parton Vol. 1 holds on at No. 1 country and climbs two to No. 21 pop in its third week on the charts there this year, while Backwoods Barbie inches down two places to No. 63 pop and up one to No. 3 country in its fourth week since its European release. A hop, skip and a jump over the Irish Sea, and The Very Best Of Dolly Parton Vol. 1, which spent slightly more than a year on the charts there before falling off the top 100 pop albums list this spring, is back for a second week in its second life, shooting up an impressive 38 spots to No. 43 in its 56th week on the Irish pop albums chart. And here in the States, her video for "Jesus & Gravity" loses the pole position on CMT's digital cable channel, Pure Country, dipping one to No. 2 in its 10th week on the Pure 12 Pack Countdown. Vote for it in the regular CMT countdown here and 12 Pack here. Although it was announced here several months ago, the first "official" word of Dolly's Oct. 25 charity concert in Kentucky came over the weekend. As a reminder, the show, to be held at Eastern Kentucky University's Brock Auditorium in Richmond, Ky., will benefit St. Mark Catholic Church, breast cancer awareness and a home for mentally challenged women. Ticketmaster has revealed that seats will go on sale to the general public at 10 a.m. Eastern Thursday, but a pre-sale will be offered from 10 a.m. until 10 p.m. Wednesday. The church's online Pastor's Notes bulletin announced over the weekend that the pre-order password is DOLLY, but I understand if you access the pre-sale through the church's website here you'll have the chance at better seats. (Those who ordered advance VIP tickets directly from the church will receive them about a month prior to the concert, so there's no need to order them again.) The church's site also says there will be some auction items available through the site when tickets go on sale, so you'll want to check those out, too! Once again, Dollywood has updated the ticket availability information for Dolly's Aug. 16 and 17 concerts at the park. The front section, rows D-L for $75 each, are once again sold out for all three concerts. The middle section, rows M-S at $60 each, remain available for the 2 p.m. shows on Saturday and Sunday and are still sold out for just the 7 p.m. Saturday engagement, while the back section, rows AA-EE for $35 each, are still available for all three performances. The shows, which benefit her Imagination Library literacy program, are available here, with $30 of each ticket being tax deductible. Although next year's expansion at Dollywood has yet to be revealed (it's usually announced sometime around mid-July) one newspaper has spilled a little information on what's coming. The Cincinnati Enquirer reports that local architecture and design firm the Bruce D. Robinson Design Group is currently in the concept planning stage with the park for a "new family adventure" which will cost approximately $5 million and should premiere next spring. Read about the firm here. "Islands In The Stream," Dolly's mega-hit with Kenny Rogers, made The Boston Globe's list of the 20 best duets of all time over the weekend, one of just four country entries on the countdown. See the full list here. Thanks to several readers for writing in Sunday night to alert me to the airing of a Target commercial on television featuring Dolly's 1993 single "More Where That Came From." The chain has used the tune in in-store advertisements for many years, usually rotating them so they appear only in one market at a time, but I believe this is the first I've heard of one of the spots airing on TV. Pop Syndicate says all Dolly fans and anyone curious as to overboard devotion to celebrities should check out the documentary For The Love Of Dolly, which hits DVD shelves on Tuesday. Read the full review here, which offers four out of four stars, and order the DVD here. The initial city to launch the first British chapter of Dolly's Imagination Library literacy program has fallen on hard times for fund-raising, The Telegraph reported here over the weekend. Since Dolly visited six months ago to announce the program, local fund-raising efforts have netted just �1,162.50 (about $2,300 U.S.), much smaller than its expected annual cost. Apparently, city officials have guaranteed to make up the shortfall, which is stirring up some controversy, but already 4,000 children have signed up in the community. Dolly's current CD, Backwoods Barbie, holds on another week in the bottom tier of the country albums charts, Billboard revealed in the July 12 numbers on Thursday. The CD remains steady at No. 58 in its 19th week on the chart, while the compilation 16 Biggest Hits rises two to No. 43 country in its 38th week. The magazine's Boxscore concert receipts report two of Dolly's European dates this week: her June 22 engagement in Kilkenny, Ireland, raked in $2.26 million with 18,103 of the 20,000 seats sold, while her two nights in Belfast, Northern Ireland, brought in $1.61 million, with 13,026 of the 14,000 available tickets sold. Emmylou Harris falls six to No. 10 country in the third week for All I Intended To Be, which contains the Dolly collaboration "Gold," and loses 32 to No. 62 pop. The Canadian charts weren't updated Thursday, so its standing there wasn't immediately available. Brad Paisley's Time Well Wasted, with Dolly on "When I Get Where I'm Going," drops two to No. 14 on the country catalog albums list, while the various artist compilation God Bless the USA, featuring Dolly's "Color Me America," inches up four to No. 59 country in its ninth week. The self-titled debut CD from Taylor Swift remains steady at No. 1 country and gains five to No. 14 pop in its 88th week, while Toby Keith's 35 Biggest Hits also remains steady at No. 2 country and No. 26 pop in its eighth chart week. Dolly's Birmingham, England, concert on Wednesday night brought some rave reviews, with The Express And Star opining here that she was "on top form" and The Birmingham Mail saying here that she "turned her two-hour concert into a good old-fashioned variety show." However, at least one audience member tells me she didn't believe the crowd treated Dolly with the respect she deserved. Catherine says she observed very little applause, standing up or singing along by the audience and felt embarrassed for Dolly that the attendees weren't as into the concert as they had been at previous performances. She further reported that Dolly did not perform her usual second-half opener, "Baby I'm Burning," instead going directly into "Better Get To Livin'." During "Islands In The Stream," Richard Dennison had to cajole the crowd into standing. In related news, finishing up the photo backlog from the European leg of the tour, galleries have been posted from Belfast thanks to Darren here and here and Charlene here, some from Kristiansand, Norway, thanks to Ellen here, some from Manchester thanks to Catherine here and some from Nottingham thanks to Cheryl here. KidsFest at Dollywood is in full swing, and The Bristol Herald Courier up the road a ways in Tennessee gives it a profile here. And thanks to Dollymania contributing photographer Jason Worley for a series of shots from the festival's opening last month (available in five galleries here, here, here, here and here) in addition to a series of images from the Dolly tour bus exhibit at the park here. (Sorry it took so long to get them posted!) The children's festivities continue through Aug. 3. I'm told Dolly was stunning in Nottingham, England, Wednesday night, with a show fans found greatly improved from last year's performance. She received several standing ovations and seemed surprised when a group of young fans stampeded down the aisle toward the stage for "Islands In The Stream," overwhelming security until additional security could arrive and force people back to their seats. The crowd was reported as "bouncing" to the chorus. A review is available from The Nottingham Evening Post here. Look for photos to be posted soon (thanks to Richard and Cheryl!). And speaking of photos, the first set that I'm behind on posting have been added to the site here. My computer has lost the e-mail that came with them to confirm, but I believe they are from one of her Glasgow performances. Thanks, Mark! More to come! London's venerable The Guardian, often compared as Britain's version of The New York Times, chooses Dolly on Thursday for its "In Praise Of . . . " editorial feature, telling readers why the U.K. will always love her. Read the article here. Cindy Adams of The New York Post talks this week with William Ivey Long, costumer for Dolly's adaptation of 9 To 5: The Musical, about the show. Read what he had to say here (be sure to continue to page 2). He comments on Dolly's quick songwriting during the creative process and notes that it should be on Broadway in March. The show opens in September for a test run in Los Angeles. "If you want to feel normal," compare yourself to the Dolly �berfans from the documentary For The Love Of Dolly, says The Dallas Voice. The newspaper gives the film, out on DVD next Tuesday, a "B." Read the review here, and reserve your copy of the film here. Dolly continues to keep fans, and the critics, happy across the pond in the U.K., where her sold out and nearly-sold out performances keep bringing in good words. The Nottingham Evening Post provided a positive review of her show there here and had previewed the night with stories from her fans here. The Times offered four out of five stars for her second Glasgow engagement here. Glasgow Evening Times gives its opinion on that concert here, and The Telegraph does the same here. You get a preview from Metro here and a series of her best quotes in advance of Wednesday's Birmingham, England, show from the nearby Shropshire Star here. That show will be followed by Cardiff on Friday and then she wraps up the European leg of the tour with back-to-back shows in London on Saturday and Sunday. Also thanks to Mark for confirming that one of her nights in Glasgow was filmed. He reports that posters were seen in the venue disclosing the filming, that the show began with a disclaimer stating that if you stayed for the show you were granting permission to be filmed and waiving all rights, and Dolly announced during the concert that it would be released on DVD (and prodded that if anyone was with someone they shouldn't be, they'd better swap seats). This is a bit of a brief update, as your webmaster just returned from vacation tonight. Look for photos in coming days from Manchester, Belfast, Kristiansand and even some non-Dolly images from KidsFest at Dollywood that one of the site's contributors sent in recently. Some additional seats have opened up for Dolly's Aug. 16 and 17 concerts at Dollywood, the park revealed this week. The front section, rows D-L, tickets for which are $75 each, had been sold out for all three concerts (2 p.m. and 7 p.m. on Saturday, and 2 p.m. Sunday), but as of Tuesday, only the Sunday show was sold out. Likewise, the back section (rows AA-EE, $35 each) had been sold out for the 2 p.m. Saturday show, but some seats are now available there for all three shows. The mid-section, rows M-S ($60 each), had been available for all three shows but are now sold out for the 7 p.m. Saturday show. The concerts are to benefit her Imagination Library literacy program. Tickets are available here. Columbia Nashville has decided to name Jessica Simpson's upcoming CD after the song which Dolly wrote for it and sings with her. "Do You Know" will serve as the project's title track, according to an Associated Press report on Tuesday, a version of which is available here. The collection will hit stores Sept. 9. According to published reports, Dolly has opened up a U.K. office to manage the British chapters of her Imagination Library literacy program. She is quoted in a wire service article here joking: "With this exchange rate, if I had to keep shipping money from Tennessee to the U.K., I would have to change the name of Dollywood to Dollywas." Other reports have said that she is dedicating a portion of the proceeds from the current European leg of her Backwoods Barbie World Tour to provide the salary for an executive director to staff the British office.